Team Suzuki Press Office – March 29. 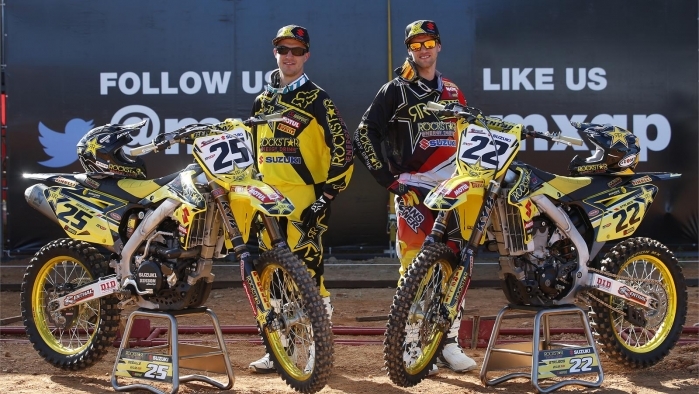 Suzuki RM-Z450 and RM-Z250 machinery marked the fastest pace around the red jumpy and bumpy Beto Carrero circuit today as Kevin Strijbos and Glenn Coldenhoff sealed pole position in the MXGP and MX2 classes respectively for the Grand Prix of Brazil. Hot and humid conditions greeted this third round of 18 in the FIM Motocross World Championship and after decent starts and an effective rhythm around the Santa Catarina layout, Suzuki celebrated its first Saturday double sweep since the 2010 Grand Prix of Latvia. Strijbos was in fine form and after drifting into the lead on the opening lap of the 20 minute and two-lap Qualification Heat, the Belgian eased to a confident and comfortable margin of victory. The performance was akin to his Pole seized at the first round of the season several weeks ago in Qatar and gives the veteran an impressive two-out-of-three ratio. MXGP was comprehensively owned on the first day of action at Beto Carrero by the Rockstar Suzuki Energy World MXGP crew as Clement Desalle followed Strijbos to the chequered flag in second position; allowing the Belgians the first and second choices in the gate for tomorrow’s motos. Over in MX2 and with the Rockstar Energy Suzuki Europe RM-Z250 Coldenhoff raced to his first Saturday win of the season in just his third GP appearance in yellow. The Dutchman chased and passed early leader Jose Butron to claimed victory by three seconds from Max Anstie. With World Champion Jeffrey Herlings absent through injury, Coldenhoff is the sole rider in the class with experience of winning a Grand Prix and now stands in a great position to obtain his second career triumph tomorrow. The weather outlay for Sunday predicts cloudy and unstable conditions but with a small amount of rainfall forecast.